SF Canada member Douglas Smith will be offering an online workshop via Cat Rambo’s “Rambo Academy” on selling reprints and other ways to leverage your short fiction. The workshop is scheduled for Saturday, July 21 and registration information is available here. What do you do with a story after it’s been published? In this workshop, multi-award-winning Canadian writer Douglas Smith, whose work has been published in twenty-six languages and thirty-two countries, discusses story rights and licensing, including language, geography, media (print, electronic, audio), and occurrence rights (first rights and reprints), and how to sell reprints to markets you may be overlooking, including audio and international foreign language markets. 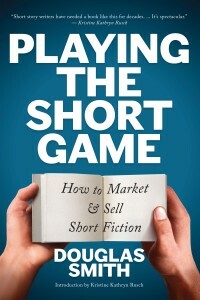 The author of Playing the Short Game: How to Market & Sell Short Fiction, Smith will give you the vocabulary and knowledge you need to make more from your short fiction. In other news, Douglas’ shapeshifter story “Out of the Light” will be reprinted in the upcoming antho “Crazy Town” from Rogue Blades Entertainment.